Devotees: (all shout simultaneously, enthusiastically) Jaya! Hari bol! Prabhupāda: He is so beautiful. (laughter) Kandarpa-koṭi-kamanīya-viśeṣa-śobhaṁ. And calling us, by playing on His flute, nice flute. When He was playing His flute, all the gopīs, they would give up all their family duties, everything, and go off to Kṛṣṇa, Kṛṣṇa. Their fathers, their brothers, their husbands, who will call them, "Where you are going? It is dead of night!" "No, we are going to Kṛṣṇa." Devotees: (laughter) Jaya! Hari bol! Prabhupāda: So, Kṛṣṇa is so nice. Just to attract us, that you want love, here, at Vṛndāvana, He appears at Vṛndāvana, in Vṛndāvana, and shows His līlā, His activities, just to attract us. How lovable object! You are trying to find out something lovable. You are being frustrated. Here is something complete, if you love, you will become complete. And this Govinda can be achieved simply by love. You don't require any other qualification. He is so great, He is the Supreme Personality of Godhead, He is the proprietor of everything, but what does He want from you? In the Bhagavad-gītā He says, patraṁ puṣpaṁ phalaṁ toyaṁ yo me bhaktyā prayacchati (BG 9.26). We can worship Kṛṣṇa with a little flower, with a little fruit, a little water, that's all. How universal it is! A little flower, a little fruit, a little water can be collected by any poor man. You don't require to earn many thousands of dollars to worship Kṛṣṇa. Why Kṛṣṇa will ask you, you contribute dollars, or millions of rupees? No. He is full in Himself. He has got everything, complete. So He is not beggar. But, He is beggar. In what sense? He is begging your love. Therefore He says that patraṁ puṣpaṁ phalaṁ toyaṁ yo me bhaktyā prayacchati. He is not beggar from you a little flower, a little fruit, but Kṛṣṇa said, "If something should be given to Me. Please try to give Me something, because that is the token of love. You are taking so many things from Me. I am supplying you light, I am supplying air, I am supplying you water, I am supplying you life, food, everything. You can not reciprocate something for Me? I am asking you simply a little water, little flower, a little leaf." So, what does He want? He wants yo me bhaktyā prayacchati. He wants simply bhakti, or love, pure love. Yo me bhaktyā prayacchati tad ahaṁ bhakty-upahṛtam aśnāmi prayatātmanaḥ. And because a devotee is lover of Kṛṣṇa, brings these things in love and devotion, therefore Kṛṣṇa says, aham aśnāmi: "I get that and eat that." Prabhupāda: So Kṛṣṇa worship is not very costly affair. 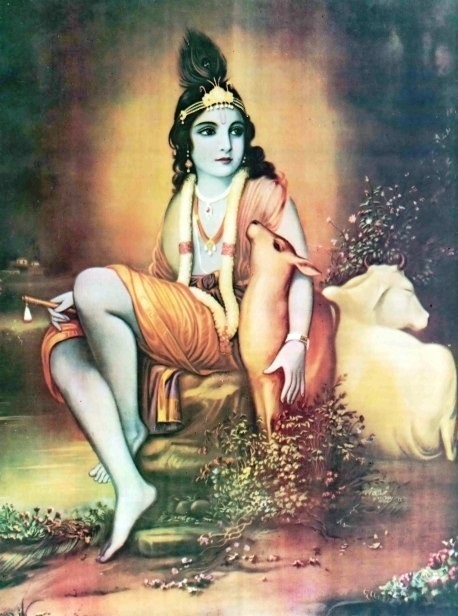 Simply you have to decide that "I shall love only Kṛṣṇa." And if you love only Kṛṣṇa, then you will actually love everything. If you love..., because you are loving the root. Just like if you supply foodstuff to your stomach, then you supply foodstuff all the parts of your body. This is the method.